When you buy a beautiful slate countertop or floor, the next thing that comes to mind is keeping it looking good. Slate is durable, strong, and comes in beautiful blends of different colors. One way to extend the stone’s life is to keep it clean. Sand and dirt can etch its surface but regular cleaning reduces wear and tear. So how to protect your slate floors while keep it clean and shining? Slate is cleft and flaky. Some pieces of the stone may break off or flake in the first three months after installation. The flaking off is referred to as spalling, which is a natural process in the stone as it adjusts to a new environment. The room with installed slate will be dusty and have small chips. Sweep the slate to remove the chips and dust. You can vacuum daily with a vacuum that does not have a beater bar. The spalling stops naturally when the slate settles. Allow the floor to air-dry and avoid traffic while the floor is drying. Buy a high quality mop that is not oil-based. Most janitorial supply stores and home improvement stores stock different types of mops. Dry-mop the slate floor daily depending on its location and traffic. Shake the mop thoroughly and keep it outside after use. Place doormats at strategic places where people can wipe their shoes before stepping on the slate floor. Do not place rubber-backed mats on the floor because rubber can damage or stick to the slate floor. You can vacuum a slate floor but ensure that the brush attachment is soft. Do not jerk or bang the vacuum cleaner on the slate floor because this may lead to scratches, chips, and other damages. Wipe spills immediately with a soft cloth or paper towel. Scrub off stains that remain after mopping with a hand-held scrubbing brush made of nylon or any non-metal bristles. Use soapy water to scrub the stains and then rinse. If stains occur on non-colored grout, mix hydrogen peroxide and water in equal parts and then spray. Leave the spray for 15 minutes and then spray again. Do not spray the solution on colored grout because hydrogen peroxide has bleaching properties that will discolor your floor. Apply a paste of baking soda and hydrogen peroxide on stubborn stains. Give the bubbles time to settle before applying the paste. After the paste dries up, spray the solution of water and hydrogen peroxide again. Wipe the floor using a paper towel or a soft cloth. Another important tip on how to clean slate floors is to apply shaving cream on stains. Test the shaving cream first on a hidden spot to ensure that it will not discolor grouted areas. Once you determine that the shaving cream has no bleaching effects, apply it on the stained area. Leave it for about 15 minutes and then rinse it off with warm water. Buy stain removal products from tile and stone retailers and manufacturers. 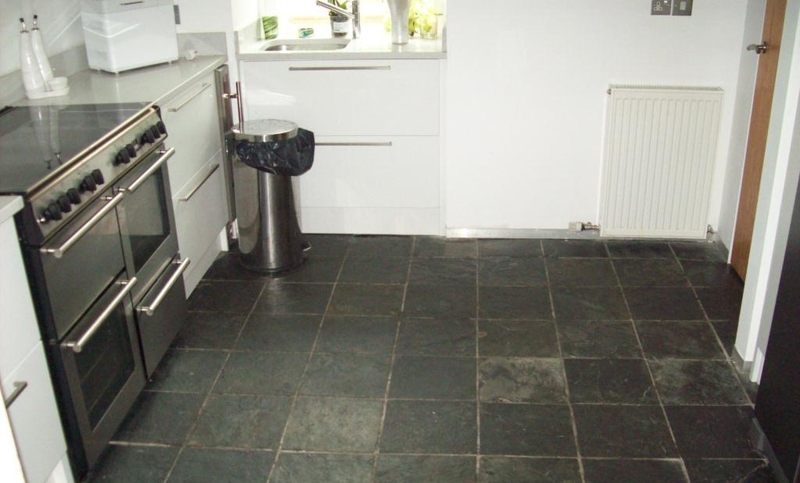 Ensure that the product is not acidic and is recommended for slate floors. Reseal your slate floor after removing stains to avoid permanent stains on it in the future. Do not use acid-based cleaners including natural types such as vinegar because they will damage your floor. Choose cleaners designed specifically for slate floors from the wide selection in the market. Rinse free cleaners are recommended because they do not leave a dull residue on the floor. Use mild detergent like the one used to clean delicate clothes. It is cheaper than most specialised cleaners. Use environmentally friendly detergents to clean slate floors. Plain warm water is enough for regular cleaning. One method of how to clean slate floors is to avoid dirt at the first place. Using high quality sealer to coat the floor protects it from liquids and leaves a high gloss finish. Apply multiple layers but let each layer dry for about 30 minutes before applying a new layer. Avoid regular wax because it leaves the floor slippery and with a dull finish. Replace the coat every few years. Place throw and area rugs in the areas that are likely to get stains and spills. Such areas include those near kitchen appliances and doorways. Do not wear shoes on slate floors because they introduce debris, sand, and dirt that scuff and stain the floors. Wipe spills immediately and develop a cleaning and maintenance routine. Server responsed at: 04/23/2019 6:41 a.m.